What is the must visit tourist destination/attraction in Dubai? People say it is desert safari. Well, where else can you experience a life in the desert rather than in a desert country? 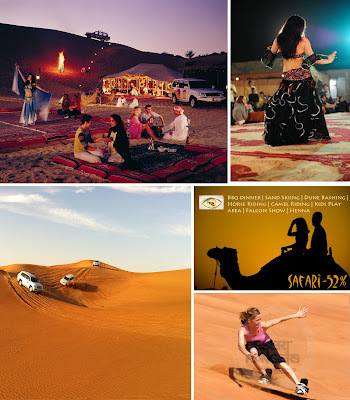 Pick up and drop from and to our apartmentDune Bashing (that car bashing in the desert sand)Sand SkiingCamel RidingFalcon Show Henna (getting your hand painted)BBQ Dinner Buffet We were so excited! I mean, look at those pictures from the Internet. The day came and our high expectations started to crumble bit by bit from the first call of the driver who was supposed to pick up us at our apartment. "Your apartment is too far, we are going to be late. Let's meet up at Deira City Center Mall."